Yahoo! recently banned work from home. The news made splashes and attracted backlash. 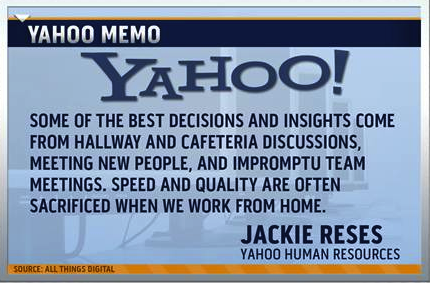 To me, it looks more an effort to rectify the inefficiencies in Yahoo organization that have creeped up over the years than a productivity statement. It looks remedial and reactive. If so, the Yahoo-wide ban on working from home is an overkill. It is doctoring the symptoms rather than addressing the cause. If not, and it is actually the company’s vision of how Yahoo engineers should work, the move may backfire. I am not a big proponent of work from home. You won’t find me canvassing for it on campaign trail. Work from home is a privilege not a right. Organizations are social structures to make people work together to achieve its goals. Getting together under one roof certainly looks the most efficient way to get people to work together. Kids go to school – they don’t “study from home”. Hospitals need patients to come over – they don’t “heal from home”. Passengers don’t “fly from home”, lawyers don’t “argue from home” and prisoners don’t “serve their term from home”. The problem is the kind of organization Yahoo is – one where success is primed on creativity and innovation of its knowledge workforce. Work from home does not, by default, entail a contradiction to what such an organization is supposed to do. Yahoo is not a school or hospital. Its engineers are true knowledge workers – a commodity that works completely differently than those that work shifts on a factory floor. They don’t turn on at 8 AM and turn off at 5 PM. Fortunately or otherwise, their brains accompany them everywhere they go – whether its office or work. The lines between home and office have gotten fuzzier over the years. Imagine a software engineer stuck up with an architectural problem on a Friday evening. Take a guess what he will be doing over the weekend (and worse, his girlfriend would think there is another girl in his life!). Unfortunately, knowledge work today is largely influenced by the constructs of industrial work and manual labor: The 9-5 routine, commuting to work and rigid separation of work and family lives. The mechanistic rules are sometimes abruptly applied to knowledge world. An artist is expected to “start being creative at 9” and “end being creative at 5” only to seemlessly pick up from where he left off the next morning. This doesn’t work. They need to be trusted, given independence, flexibility, authority and an environment to self-organize. They need to be let loose. If that sounds scary to you, then you have bigger problems than letting people work from home! And that’s where the bigger problem is. It’s not banning work from home. It’s the message that it sends across to those that make the organization. Work from home should never be the rule. Getting up in the morning and not feeling like going to office is not a good enough reason to work from home. However, that it can be immensely helpful in knowledge organizations in many situations – when an engineer needs solitude to think through a complex problem, an executive needs a break to think strategy or the simple logistics of a day make it infeasible to commute but practical to work from home. With the means available today, communication and collaboration can never suffer in short term! Trust your people and they’ll make it work. Probably apocryphal, and certainly not pedagogical, the incident does highlight what’s wrong when the organizations become suffocating for their people! Peter Drucker argued that the biggest challenge for the managers in 21st century is to create an environment to make their knowledge workers productive. Banning work from home is certainly not going to help do that! This entry was posted in Knowledge Work, Productivity, Time Management and tagged Organizations. Bookmark the permalink. Interesting analysis ! However, I think that I would agree with the fact that employees should come to office. If people come to a common place even for three to five hours a day they can communicate effectively with each other and working together usually minimizes confusions and helps in idea development. An example is how Fruit Ninja was born. Halfbrick divides its teams into groups and they work together and come up with ideas. This is how they came up with the concept of Fruit Ninja and I think (but that is only me) that people working as a group at different times and locations may find it hard to be creative in same sort of exercises.